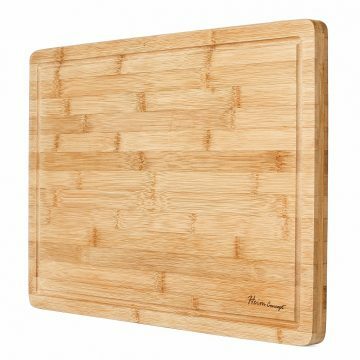 Cutting boards are staple kitchen essentials – you can (almost) never spot a kitchen without one. They come in varieties too, with maple boards being the top contender in the wooden board competition among enthusiasts, hobbyists and professionals. While other options like plastic and composite offer their respective advantages, maple boards being naturally wooden are eco-friendlier and highly capable of staying free of bacteria. Aesthetically pleasing and possessing sustainable properties, maple boards are more affordable and are also less vulnerable to degradation inflicted by pests. They are built to last, and they help preserve the quality of knives. Often retailed at much more attainable prices, these boards can even be used as substitutes for butcher counters and can complement kitchen islands without effort. There are other wooden alternatives out in the market today, but with maple boards being the most sought after type, you might want to check out these top 10 best ones using this guide. Knowing your kitchen habits is an important factor in determining what type of maple board you might need. Some boards are built for specific cutting and preparation needs, while some are designed for more general use. Don’t rush to purchase a board that costs more but is prone to be infrequently used. You might be surprised that even the low ranking ones in this guide are already sufficient for a few quick cooking fixes. Take the time to assess what you may need the board for, and how often you might be able to use it. After that, feel free to read up on the following top rated boards to see which one fits your need best. Dimensions: 18 x 24 x ¾ inches. Made durable by premium Canadian maple hardwood, which makes it strong and sturdy for chopping fixes. Requires only warm water and soap for washing, and needs mineral oil to maintain quality. Non-toxic, reversible, and naturally antibacterial which makes it a safe kitchen option. If you need something that fits as a useful kitchen tool and a tabletop inspiration, then this model should work well for you. The hardwood naturally gets rid of the bacteria that other types of boards have a tendency to retain. Its weight of 7.5 pounds also makes it a more controllable board when you’re rushing to make meals – more lightweight boards have the tendency to move around if they’re not specifically designed to stay still. Sufficiently fits any type of cutting or chopping need. Its variegated colors make it an aesthetic compliment on any kitchen surface. Largely comfortable to use and has adequate room to hold pieces of ingredients. Made flexible by its reversible design, which requires less frequent cleaning when in a rush. 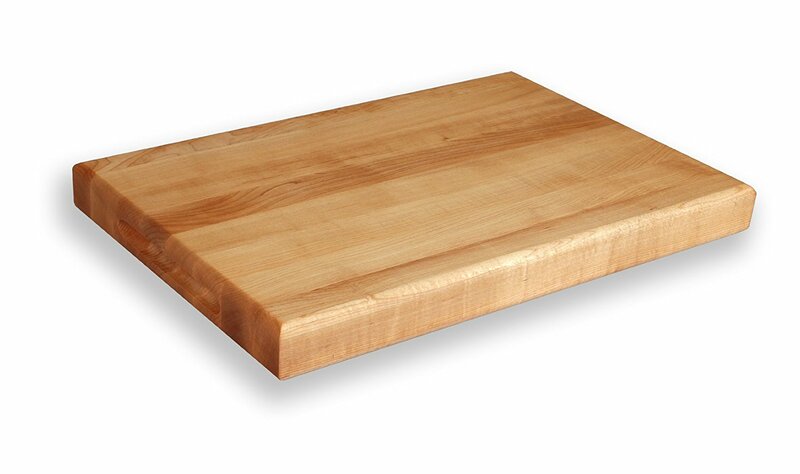 This board has the tendency to curl up after a number of uses since it’s made out of softer maple. This can be remedied by cutting the edges and sanding them or if that doesn’t work, use the warranty to have it replaced. Cleaning this requires mineral oil, which entails additional costs. This is an inexpensive product that does well in most kitchens. 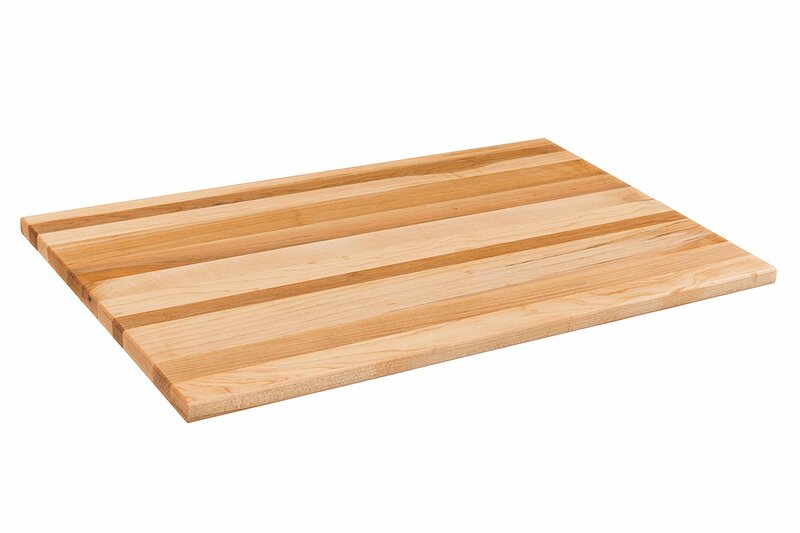 If you need a board for simple cooking tasks, then try this one out for yourself. Made out of solid Northern Michigan maple wood; certified by the National Sanitation Foundation as well. Grain construction has the dimensions of 20” x 15” x 3 ½, making it wide, sturdy and long-lasting. Mineral oil finish found on the bottom edges, paired with a 3/8” radius top. Not quite the usual sight you might see in kitchens, but this model should work wonders for heavy kitchen users. The heaviness of the model prevents it from sliding, so if you worry a lot about that, this one shouldn’t be able to trouble you more. It’s also said to work remarkably well on any countertop, and the extra height makes cutting a less tiresome task since it props up hands at a more comfortable angle. Will probably serve a lot of consumers a lifetime of use – the bulk doesn’t easily give in to degradation. Ideal for heavy chopping tasks enabled by its width and depth. Looks appealing on counters – giving it good oil lapping can make the colors pop out. Doesn’t mark over easily as well, which helps preserve quality and aesthetic design. The heavier weight can naturally make cleaning a tiresome chore. For smaller framed individuals, this one can be quite too heavy to lug around. Packaging needs vast improvement – the board gets shipped with only a thin plastic wrapped around it sealed tight inside a cardboard box. This is bad news for long distance shipping as the board gets more prone to damage. There’s probably only one thing you should consider before you make this product purchase – are you a heavy user? If so, look no more! This block has even amazed chefs and market choppers. It’s also much less expensive, and is fit for all of your kitchen needs for a lifetime! Made out of pure Michigan maple wood; built to last with a mineral oil finish. Measurements are: 24” in length, 18” in width and 1 ¾” in thickness. Designed with Reversible Radius and is NSF-certified as well. Sturdily made for heavy duty and can be conditioned prior to use for lustrous wood maintenance. Looking for a smooth countertop alternative? This Michigan-based model is not only smooth for all kinds of uses, but is also quite flexible and extendible in terms of quality and performance. 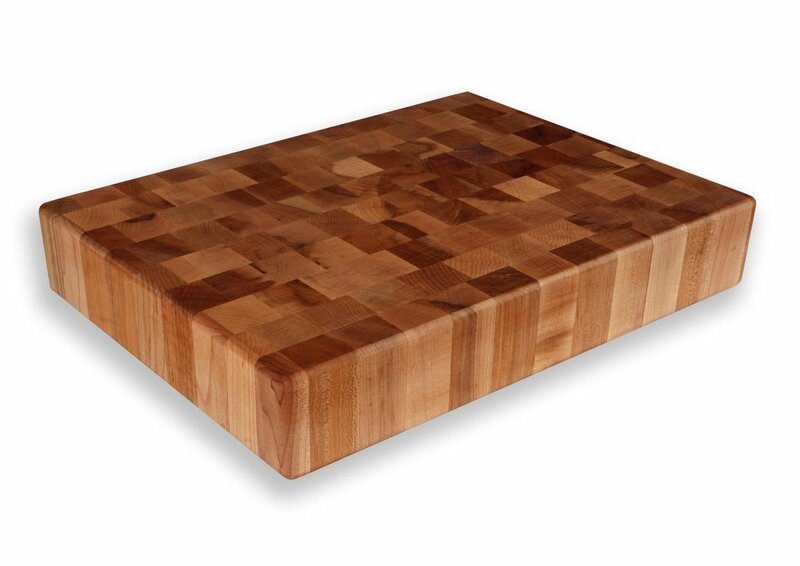 The nice grain makes its cutting surface soft and smooth on the hands, and the hydrated maple finish can be achieved by conditioning the board with the Butcher Block Conditioner every day for every week for a month. Height makes it perfectly balanced so you won’t have to worry about putting your weight on making it stay still. The measurements naturally make it a wide board which is ideal for slicing or chopping four or more ingredients all at once. The maple’s antimicrobial nature makes it more resilient against degradation. At 19 pounds, this model is naturally heavy to lug around the kitchen area. Make sure to place it in a specific area that’s convenient enough to access for permanence. Vulnerable to degradation if constantly in contact with water. Try not to rinse this board if it’s not really necessary to do so. Board may stain since the wood is naturally porous. Remedy: do not cut raw meat as it can damage the board further. Use a separate board type for heavy meat chopping. Flexibility is what gives this model a higher ranking than the previous one – having it conditioned regularly can help you extend its life. It’s said to serve users up to 2 years plus when really taken care of. Other than exceeding a lot of customer expectations, this product lives up to performance and appearance in sufficient amounts. Extra size for extra durability: measurements are 18” x 12” x ¾”, providing more than sufficient space for heavy vegetable, meat or fruit slicing. Fully functional for cutting, chopping and prepping food! The drip groove design prevents liquid from dripping off of one side of the board. Reversible for multi-use! Flip the board over to the smoother side to use it for bread or pastry. Only needs warm water, soap and air drying as maintenance. Aesthetically and functionally great as a gift idea for all kitchen enthusiasts, this model is a powerful in terms of preserving quality. The Moso design enables it to be stronger than most maple hardwood types, and is also largely safer for kitchen consumption. Cleaning is also said to be more of an easy task, so this models’ maintenance shouldn’t be too much of a worry on your part. Lessens wearing or dulling of knives; generally lasts longer even when constantly used. The board’s stain resistance makes cleaning less of a chore as well – users only have to scrub it with coarse salt, rinse and then dry. Cutting surface doesn’t get slick because the surface absorbs liquids. Has lesser tendency to warp or curl up, and is lightweight at 3.7 pounds. The porous surface has the tendency to retain odor. This can be easily remedied by rubbing small amounts of baking soda over the board and then rinsing and drying. Its light weight makes it a challenge to hold in place especially on slick counters. Try to hold it in place on dryer surfaces. If durability speaks the most to you in volumes and lightweight is what you need to get the job done, then this model could work for you. Who wouldn’t like the fact that it requires less time to clean? For what it’s worth, you can highly benefit from its extra protection without having to resort to buying another one in the long run. It’s elevated with four bun feet which lifts it up off of table tops and counters. Measurements are 12 x 12 x 15” which works remarkably well for a variety of food preparation tasks. Antimicrobial, easier on knives and comes in two colors – maple and walnut. The edge-grain cutting surface is sleek with a natural oil finish, making it solid and resilient for cutting, chopping or mincing. Said to be have been manufactured by foresters committed to environmental integrity, this board is made out of premium maple trees that are carefully selected. It’s not as hefty as other solid blocks of maple boards, but its weight and feet help it keep in place wherever you may feel like you need to put it. It’s also easy on the knives and is proofed to hold up longer. It also has a much smaller size that measures around 9 inches. Size sits perfectly in smaller countertops, making food preparation a much more enjoyable task. The wooden felt helps protect the bottom of the board from food juices or water, and prompts the user to cut at a much more comfortable angle. The weight also makes it more portable so you can take it to the table or any other flat surface. As previously mentioned, the cutting surface helps extend the life of your knives. Being a lot softer than most maple hardwood types, dents and marks will ingrain on the surface after consistent or constant use. Suggested remedy is to sand the surface and apply beeswax for maintenance. The board is naturally not reversible or flexible due to the wooden feet. Has the tendency to warp or splint if not regularly cleaned. If you’re looking for comfortable stability when you mince, slice, or chop, then consider trying out this model. 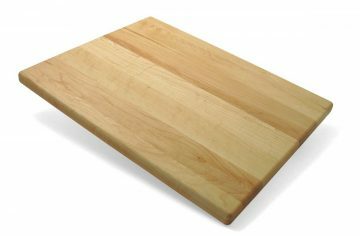 Other than being another safe option for your kitchen, this board is already sufficient for various prep jobs you might need. It’s well worth the price if you just actually make sure to clean it up after heavy or quick duty. Its grain construction measures at 15 x 15 x 2, providing adequate room for cutting or slicing three or more ingredients. Also, it’s made to last a lifetime by its solid Northern Michigan hard maple type. Reversible with a 3/8” radius top with the bottom edges slicked with a mineral oil finish. Stable enough for a variety of uses at 11 pounds. Primarily made for heavy chopping duties, this maple block is also perfect as a table top or counter design. 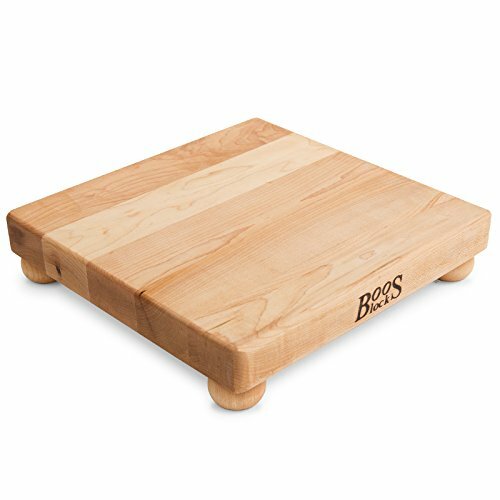 It holds up well for quick meal preparations, and is said to last a lot longer since it’s made from solid, hard maple. It’s not too cumbersome to lug around, and the weight does a good job of keeping it down on various surfaces. The reversibility also makes it a great choice if you need more time to prepare or if you need to cut less time on the cleaning. Does a great job at locking the moisture in which is enabled by its being freshly cut and sanded. May last for decades with proper care but generally requires less times to clean. Absorbs impact from chopping extremely well, as what it is mainly designed to do. It also makes adequate space for separate mincing, chopping and slicing. The end grain looks quite a bit porous, which makes it vulnerable to lateral swelling since it’s made to lock the moisture in. Try not to do too messy jobs on it if not needed. May have big bar clamps in a few places which may be uncomfortable to some, but leaving it overtime should fix it. The block may need a liquid stopper to avoid spills. For heavy chopping duties, it’s best to get something that’s specifically designed to absorb different knife blades. If you need something that doesn’t need to get cleaned all too regularly, then this model could also work wonders for you. You only need to make sure it gets its sanitary fixes to make it really last longer than you expect. Has hand-smoothed edges; made out of pure maple wood. Comes in three distinct sizes such as 14 x 11”, 15 x 8” and 17 x 14”, which is great for people who wish to use more than two boards. Moderate grain patterns on the surface, which is made stable by minimum glue joints. Maple wood is said to be renewable, sustainable and adequately durable. Naturally antibacterial and extremely light at 3 pounds, this board is another widely sought out option among normal users and professionals. As it is made with the right hardness, your knives can stay sharp longer. The cleaning process isn’t complex too, which is perfect if you need to allot more time to food preparations. 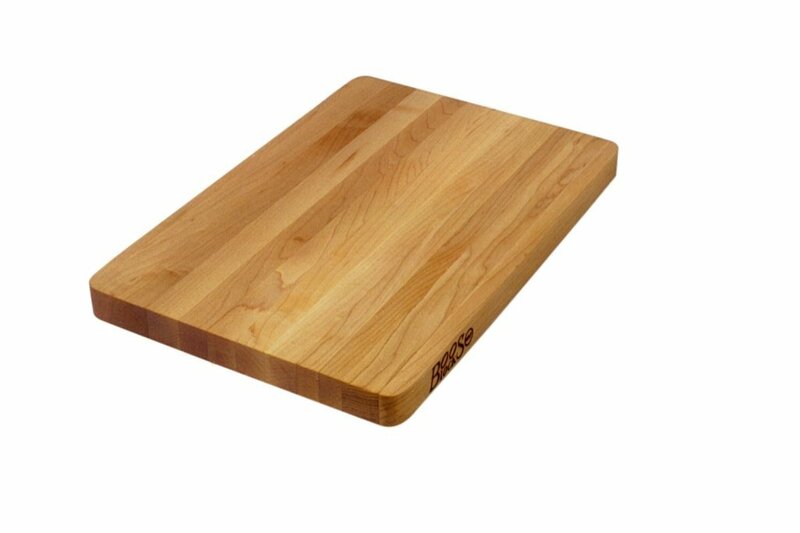 This board also is a lot wider in shape than most cutting boards, which basically gives you more room to chop or slice. Highly durable due to end and edge grain construction. It’s easily portable due to its light weight and is also a lot easier to clean and maintain. Optimal appearance can be provided by oiling the board frequently with mineral oil. Stains can also be removed easily with a combination of lemon juice and salt, or a weak bleach and water solution. Has the tendency to fade in color if exposed regularly to strong sunlight. Also has the tendency to warp on the sides where water comes in constant contact. Some users have found the remedy of purposely wetting both sides to minimize the warping to be useful. If perhaps, you would like to make use of a thinner, more portable option for your cutting needs, then this board could potentially be of great use to you. It doesn’t need a lot of maintenance for it to last long as well, so if you’re trying to stay in line with your budget by sticking to a great option then by all means try this one out for yourself. This one’s made out of solid, reversible maple wood with edge grain construction in creamed finish. The two flat sides have slightly rounded edges. Comes in three sizes – freely choose between 18 x 12”, 20 x 15” and 24 x 18” to whichever is your preference. Each slat has impressive grains that largely prevent knife marks from ingraining. It’s also naturally antimicrobial, sturdy, resilient and spacious for all kinds of kitchen uses. John Boos boards are known to be more environmental friendly than most other types, so whether you want to use one for quick preparation fixes, for your profession, or for other special types of occasions, you’re still contributing to the betterment of the community at large. Needing just plan food-safe mineral oil, it won’t take you too much time to clean and reuse this board. Its reversibility gets rid of cleaning that takes too much time. It also significantly extends the life of the board. It’s not too lightweight and not too hefty either. Weighing in at 8 pounds, you can enjoy the stability while you slice and the ability to move it around. The nice cream finish can highlight your counter or wherever you want to place the board. The usual warping problem is caused by too much rinsing and drying. You will find out that periodical wiping with damp cloth can help minimize it. Splinters can pop out if you’re not too careful with chopping. This can be addressed by sanding and treating the board to mineral oil or beeswax. Perhaps flexibility is what you’re really looking for in a maple cutting board. If that guess is right, then you might just be surprised at the results you can get from this model. It has the perfect weight balance, and with its reasonable price and simple caretaking guidelines to follow, you just might be able to enjoy it longer than you expect. Crafted out of hardwood solid Michigan maple, built to last a lifetime and resist all kinds of microbes and bacteria. 18” in length, 12” in width and 1 ¾ in thickness; made durable by its mineral oil finish. It’s also sleekly flat and smooth to cut on for a variety of kitchen purposes. It’s also aesthetically pleasing enough to be considered as a kitchen heirloom. Michigan maple, as you can see from the pattern in this guideline, is considered as a strong contender for the best maple cutting board. Never cumbersome and extremely suitable for all kinds of uses, it’s no wonder why it’s rated as second best in this category. Consider this board as a cutting superpower – the flat surface does a great job on holding a lot of vegetables, fruits and other food. Its sleek finish also largely helps in making resilient against degradation or wearing. Takes a huge chunk off of the cleaning time; only requires plain mineral oil to maintain the color and quality of the surface. The solidness of the wood automatically stabilizes whenever you use it for cutting or slicing. It can be occasionally treated to mineral oil rubs as well, which can help the wood pop out the colors. Not to porous due to the end grain construction; stains and smell can be removed with a few chemical or organic solutions. May wear down when in constant contact with water, so you will have to be extra careful with the fruit juices or meat stains. Make sure to treat the board regularly to extend its durability. The usual splinters can show up after constant heavy chopping uses. This can be done away with by sanding and treating the surface to oil scrubs. While this model is a little more on the high end but expensive side, it might just be well worth your budget! 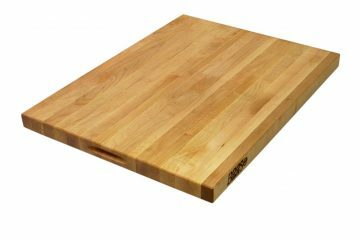 Solidly built to absorb impact and retain quality even after minimal or extensive use, this board could be your go-to kitchen option for every food preparation tasks coming your way. Made available in a variety of sizes! Choose among 8 x 12 x 1 with the juice groove, 10 x 5 x 1, 10 x 10 x 1, 16 x 10 x 1, 18 x 12 x 1.25, or 20 x 15 x 1.25! It’s reversible with 2 flat surfaces for a variety of purposes – slicing, dicing, mincing, chopping and more. Convenient chopping and slicing is made possible by the beautiful edge grain construction. The thin profile makes it easy to store and control on any type of surface. Its properties are naturally antibacterial, always making it a safe option for your kitchen. 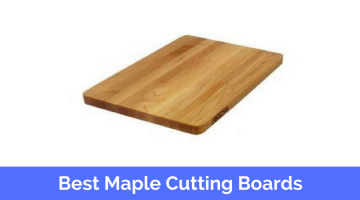 Have you ever wanted a top performing maple cutting board that comes in a variety of sizes? If so, feast on the options of this board! Rated as the best in all cutting services, this model could enable you to enjoyably finish kitchen tasks. It also doesn’t take too much maintenance control, and is wonderful on all types of surfaces or as a countertop alternative. The available sizes are said to fit excellently anywhere in the kitchen, and it’s consistently great on knives. The board’s reversibility allows you to speed up on kitchen tasks; it also takes lesser time to clean it for reusing. The solidness and weight helps keep it in place wherever you place it, so you won’t have a hard time putting your weight down like you do for more lightweight boards. 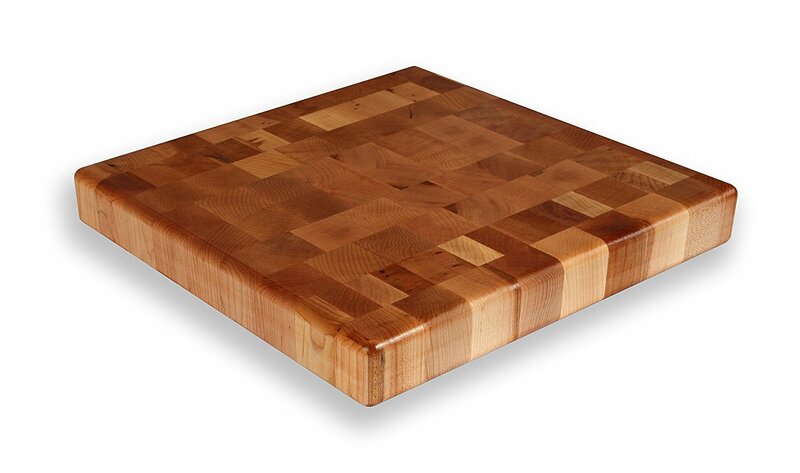 Durable enough to sustain chopping marks, which can be smoothed out by oiling or sanding. The one-inch thickness does a great job on preventing the food from spilling over or messing up the counter. Prone to cracking if not used carefully; consistent oiling and sanding should be done whenever the board feels coarse or rough enough overtime. Packaging needs a major overhaul since it does more damage than protection to the board. Other than being rated as the best among maple cutting boards, this model holds the most durable properties, which is why it’s more sought out than the others. You also don’t need to stick to the Boos oil to maintain the board’s sleek surface, so that’s another advantage to add to your budget. If you want something that holds up well, lasts a lifetime, and is very worth the money, then choose this board! Don’t get yourself too confused about what cutting board to buy for your kitchen too. If you are looking for maple boards, the 10 listed above are the top-ranking options in the market. All you have to do is decide on which one best fits your preparation needs.